Messenger Kids is a chat application by Facebook for kids aged 6 to 12. It was actually built to give parents more control and for kids to give safer space to message and video chat with close friends and family. 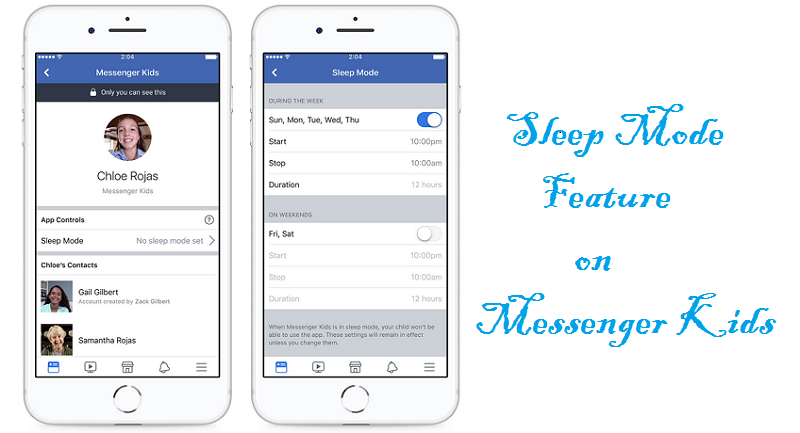 Today, Facebook is rolling out a new Sleep mode Parent control feature in Messenger Kids app. The new Sleep Mode feature will allow parents to set scheduled “off times” on Messenger Kids app on a child’s device. Thus, using the new sleep mode feature now Parents can control how much time their kids are allowed to use Messenger Kids app, even if device is with them. The new Sleep mode feature is controlled from Parent’s Facebook account using Parent Control center and Messenger Kids app will “go to sleep” and not accessible to kids during those hours. The “off times” can be changed at any time from the Parent’s Facebook account. Once, the Messenger Kids app is in sleep mode, kids cannot send or receive messages or video calls, play with the creative camera, or receive notifications. As, well as if kids try to open the Messenger kids app, a message will pop up on the screen telling them that the app is in sleep mode and to come back later. Open Facebook app and go to the Messenger Kids controls. Tap on the child’s name, and then on “Sleep Mode” in the App Controls section. Set the off times when you want the app to turn off for your child in his device. Other options are to set different times for weekdays versus weekends. In addition to sleep mode, parents can also add and remove contacts, delete the child’s account, or create a new account right from the control panel. The new Sleep mode is simple to use. Now, you don’t have to worry about constantly monitoring and changing the controls for the app. As, you can go in and adjust the times at any time, you can also just set it and forget it. Let us know your thoughts about the Sleep mode Parent control in Messenger Kids, as although the control is in your hand you need to be careful when you are setting boundaries for your kids.